2 Dress The music video includes two main characters; the artist herself and her husband in the film. The characters are both dressed to what the audience believe is their profession, a Police woman and an Office worker. Portraying the characters in work attire shows the audience that the characters are just two normal people living their lives. The song is about relationship problems and how the man should treat a women in a relationship in everyday life from a women’s point of view. 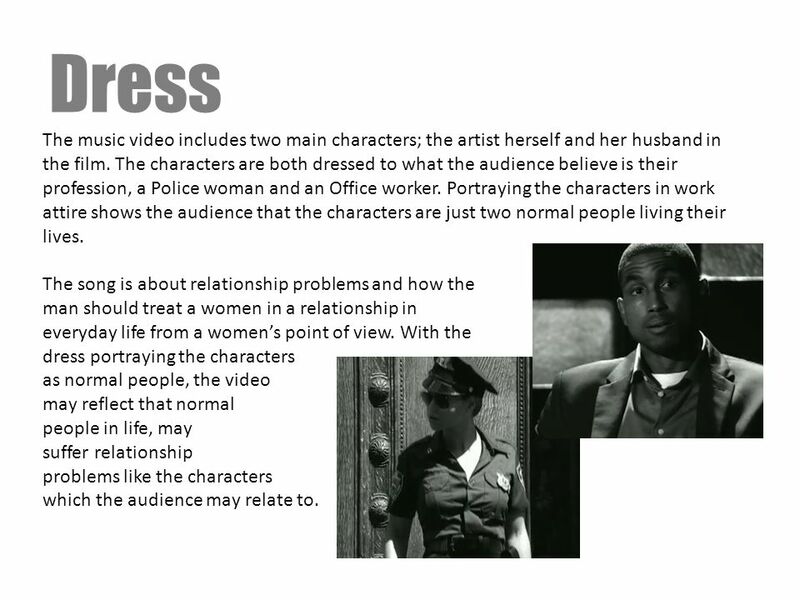 With the dress portraying the characters as normal people, the video may reflect that normal people in life, may suffer relationship problems like the characters which the audience may relate to. 3 Lyrics I'd listen to her 'Cause I know how it hurts When you lose the one you wanted 'Cause he's taking you for granted And everything you had got destroyed You don't listen to her You don't care how it hurts Until you lose the one you wanted 'Cause you're taking her for granted And everything you had got destroyed The lyrics portray a narrative throughout the song which is followed in the music video. The characters are shown in role reversal with the artist acting in place of her husband. 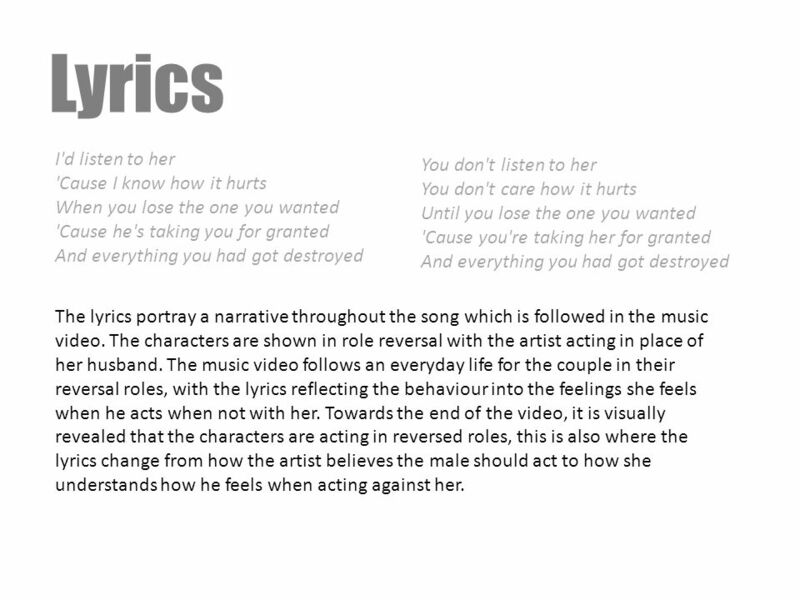 The music video follows an everyday life for the couple in their reversal roles, with the lyrics reflecting the behaviour into the feelings she feels when he acts when not with her. 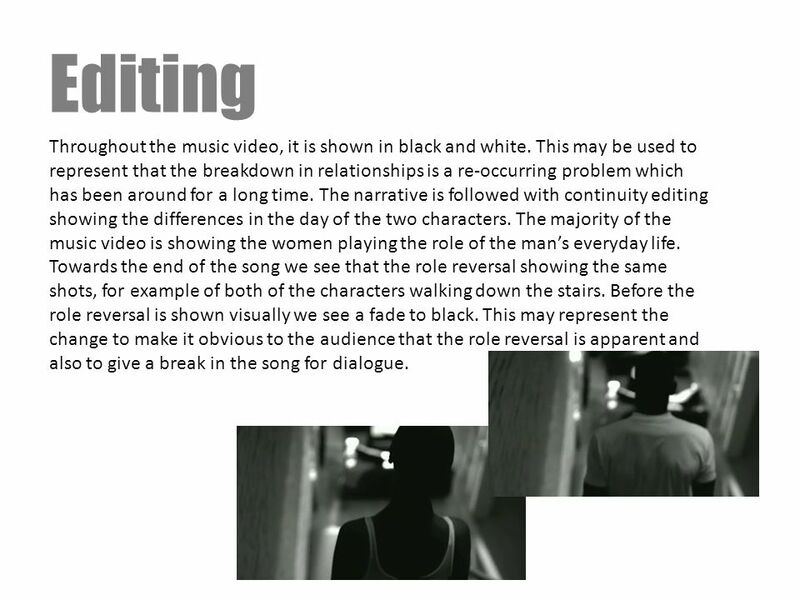 Towards the end of the video, it is visually revealed that the characters are acting in reversed roles, this is also where the lyrics change from how the artist believes the male should act to how she understands how he feels when acting against her. 4 Music The music is at a steady tempo which may again reflect the narrative of a normal day. 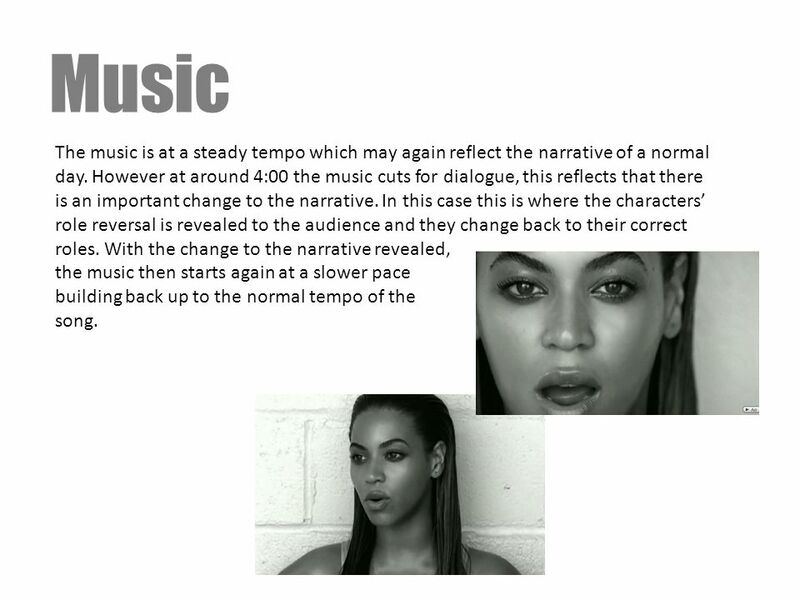 However at around 4:00 the music cuts for dialogue, this reflects that there is an important change to the narrative. In this case this is where the characters’ role reversal is revealed to the audience and they change back to their correct roles. With the change to the narrative revealed, the music then starts again at a slower pace building back up to the normal tempo of the song. 5 Genre The genre of the song is pop / R&B. The music video reflects this through a laid back mise en scene. The simple clothing, make-up, location and narrative may all contribute to the genre that is usually linked to the artist. 6 Camerawork The music video contains a range of camera shots, however the most common is mid-close ups of the characters. An example of this is at 1:45 when the colleagues are seen looking at each other. The close up increases the intensity of the male and female’s relationship as they are seen looking at each other making the audience guess what each of them are thinking. Another example of this is the close ups of the ‘husband’s’ reaction when his wife ignores his call at 2:08. This increases the audience’s knowledge of his position and again make the audience guess how he may be feeling. 7 Editing Throughout the music video, it is shown in black and white. This may be used to represent that the breakdown in relationships is a re-occurring problem which has been around for a long time. The narrative is followed with continuity editing showing the differences in the day of the two characters. The majority of the music video is showing the women playing the role of the man’s everyday life. Towards the end of the song we see that the role reversal showing the same shots, for example of both of the characters walking down the stairs. Before the role reversal is shown visually we see a fade to black. This may represent the change to make it obvious to the audience that the role reversal is apparent and also to give a break in the song for dialogue. 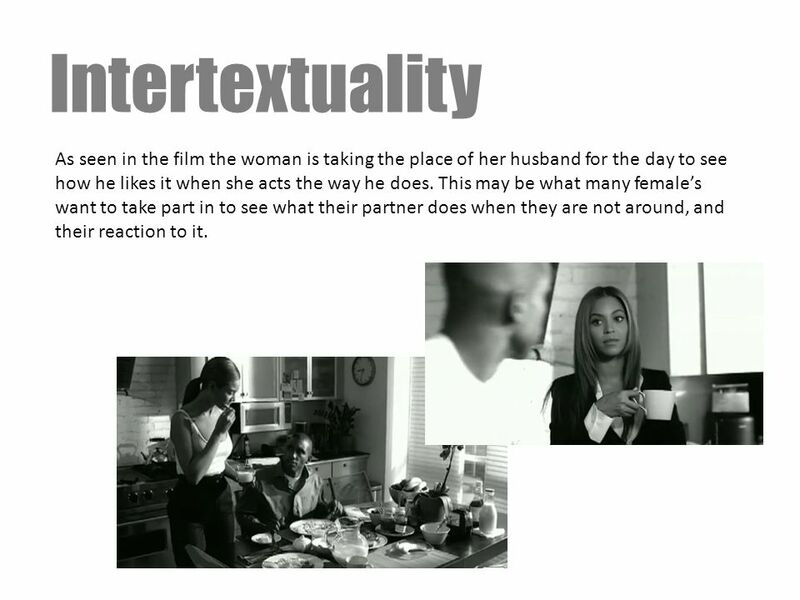 8 Intertextuality As seen in the film the woman is taking the place of her husband for the day to see how he likes it when she acts the way he does. This may be what many female’s want to take part in to see what their partner does when they are not around, and their reaction to it. 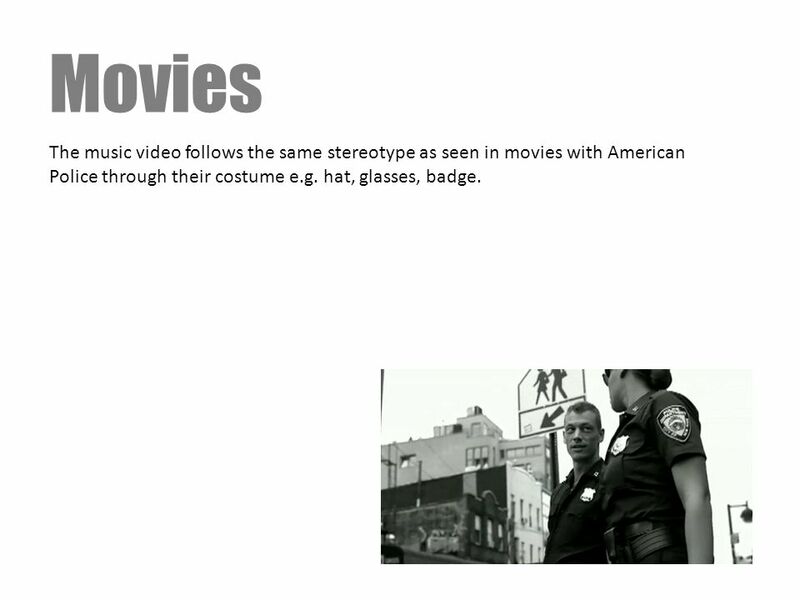 9 Movies The music video follows the same stereotype as seen in movies with American Police through their costume e.g. hat, glasses, badge. 10 Exhibitionism The male gaze is shown through the female character in the music video, who is also the artist. This video may get her more male fans or even women seeing her as their ‘idol’. Furthermore, at a part of the music video where it is seen that a man is looking at the artist, it offers that there is no harm in looking at the women, or that it is hard not to take your eyes off of her. 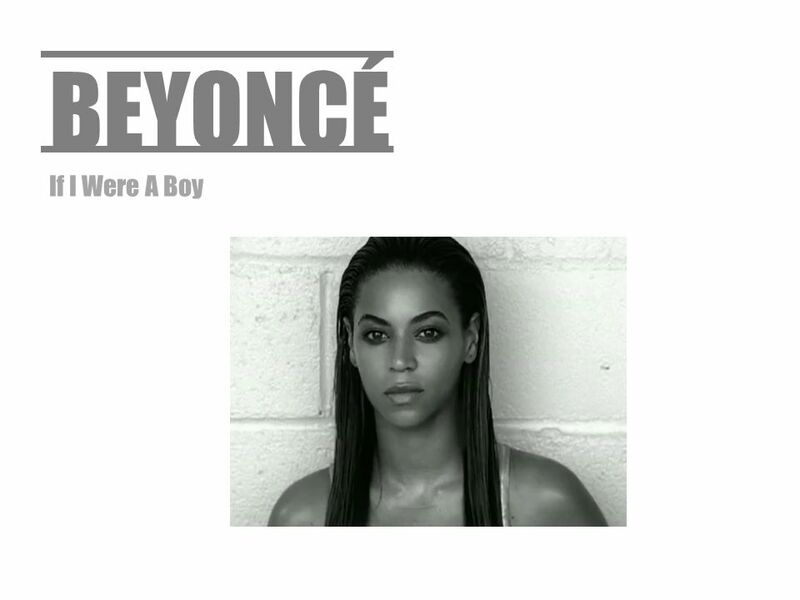 Download ppt "BEYONCÉ If I Were A Boy." Tomb Raider By EP. Genre There are different types of genres of films. For example there are comedy, action, chick flick and animation. This film is an. 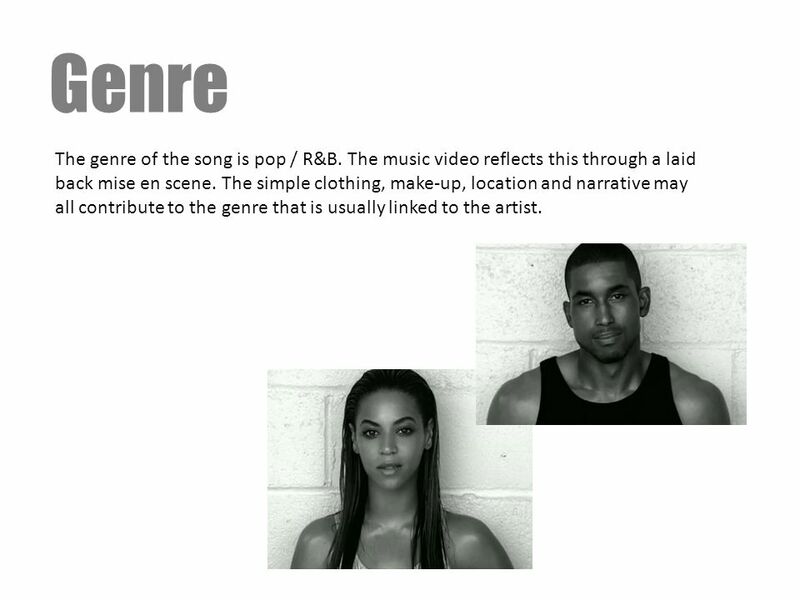 Popular Music Video Textual Analysis. Technical Conventions. When the music at the start of the video begins the camera pans round to the main star. This is the introduction to the main character and the narrative. In what ways does your media product use, develop or challenge forms and conventions of real media products By Richard Maguire. 1. In what ways does your media product use, develop or challenge forms and conventions of real media products? Tatjana Harrington-Steward- S1-08. E VALUATION Q UESTION 1 I N WHAT WAYS DOES YOUR MEDIA PRODUCT USE, DEVELOP OR CHALLENGE FORMS AND CONVENTIONS OF REAL MEDIA PRODUCTS ? Music Videos Structure. The purpose of the Music Video  Promotes a single and, normally, an album  Promotes the artist or band  Creates, adapts or. Mise-en-Scène and Danzón A Presentation By: Miguel, Nina, and Chrissy. LIKE A VIRGIN&INTO THE GROOVE Structure Performance Style (visual) Conventions Representation Goodwin PM critics. =zI9C9j0QgU4. Dress – fashion reflects the song Lyrics – establishes a feeling/ mood rather than a feeling Music – Tempo. Sic Transit Gloria Fades Brand New. Genre TT he genre of the band’s music is generally classed as alternative rock. TT he mise en scene in the music. CODES AND CONVENTIONS OF A MUSIC VIDEO (HIP –HOP). Film Title: ‘Career Suicide’ Director: N/A Film Length: 1minute 5seconds. MUSIC VIDEO PRODUCTION GENRE, CODES AND CONVENTIONS. Representation By Lindsey Harley, Mel Murray and Harley Angus. What have you learned from your audience feedback? Danielle Wilkinson.